Unlock the power of the Packrat Factions. Today we look more closely at The Runners. About Anj: And was always the leader of the Runners even before the group was members of the Packrat clan. We first meet Anj at Hack during Solstice wearing all white when he meets Faid after being introduced by Set. Anj keeps his group of Runners close and is always aware of who is where and on what run. He runs his ship tight and has a good command over his followers. Short Description: The Runners smuggle data, ware, tech and drugs from the City into the Echelons and the Zone for a price. About Data Messengers: The Runners are one of the more active factions of the Packrats. With a definite mission to smuggle data from the City into the Echelons and the Zone, the Runners have a full time job as data brokers. For the right price Runners will steal Top Secret data, transfer data or even broker and barter it from one customer to another. Corporations are known to use Runners as well during acquisitions and hostile takeovers. Some Runners specialize in only data transfers. Most of the time the data messenger as they are called use encryption keys and blanked credit cards for their transfers so the data sales and handoffs can not be traced. Data messengers use encrypted pin drives and data cards for their data transfer as they are light to carry and can store over a terabyte of data. Most data messengers have special encryption keys that only they know and use. Each key is unique and the customer who will be paying or delivering data needs to have the corresponding key so that the transfer can occur. About Drug Runners: The other main feature of the Runners is to smuggle drugs such as synth a healing drug, iodine pills to combat radiation sickness and psi inducer drugs like neurocyne and dylon. These drugs are smuggled from labs in the City such as the SenseNet and then through the Runners tunnels and back channels are brought into the Echelons smuggled through the Gateway Zone Cross. Drug Runners are mostly specialized and will only go after certain drugs. Those who smuggle iodine pills usually focus on that and synth. Those who smuggle psi inducer drugs focus their skills there. The Processing Centre: The Processing Centre in the Packrat Sprawl is where the Drug Runners bring their stash they bring back from their runs. It is managed and stored in the Processing Centre and categorized and logged. Some drugs have nanomachines added to them for efficacy, others are refrigerated to keep like dylon. The Processing Centre uses an encoding system using the Packrat symbol code which is secure and only Packrats can read. Some symbols are particular to the Runners and can only be read by them. The synchlovere machine is used as a centrifuge when nanomachines are added to psi inducer drugs and refrigerated. How Runs are Conducted: There is an online electronic board in the Processing Centre that keeps track of all current runs that are in progress. Each Runner is logged on the board when their run starts and includes location, what they will procure and time lapse for the run. Anj maintains the board and lets no one else except sometimes Faid run it. The electronic board keeps track of all historical and future runs and can be used for inventory. If a run is not successful that is also logged. Runners have codes they use that are input onto the board in the case they are intercepted or unable to procure their target, or are hurt on a run. These codes are closely monitored by Anj and only Runners know the numeric codes and what they mean. 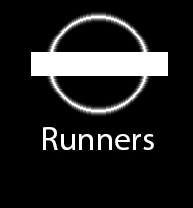 Runners Tunnels: The Runners Tunnels are a set of tunnels and corridors which come off the Packrat Sprawl and run under the Echelons and the Zone and lead up into the City underground. These tunnels are elaborate and have TV monitors, close captioned monitors and terminals, as well as health and first aid stations scattered at key locations. One such location is under the Broad Street subway station in the City and under the SenseNet building. The Runners GPS system connects these monitors and can be read on a Runners’ handheld to help them target where they will procure psi inducer drugs or data. The Runners GPS monitor under the SenseNet is hooked into the SenseNet security system and can show a full schematic of the building every room, lab and storage location. The Runners hacked the SenseNet which is not aware their systems are compromised. Key Members: Rom and Faid. Faid is one of the key Runners and one of the few that will go on Runs to the Shizuoko ghetto which has high radiation. Faid is highly sought after as a Runner for that very reason. Faid mostly smuggles data but has been known to smuggle drugs as well. Rom on the other hand is a Runner but he is sequestered and has gone on few runs, the ones he has been on he has mostly been accompanied by a more senior Runner. Rom mostly works in the Processing Centre cataloguing psi inducer drugs. Runner Trivia: A caught code is a code when a Runner has procured their stash (drugs, data) but been tagged, caught/seen, or hurt. The first time the caught code is mentioned is in one of the later grydscaen books when we see a full run go down with the code mentioned and the Runner gets hurt after procuring their stash and has to get back to the Packrat Sprawl to deliver the goods.